Terrorists target London with multiple attacks. It's a nightmare scenario devised by Panorama with the help of security experts to test how well Britain would cope. But the government condemned the exercise as "irresponsible" and refused to co-operate. Taking morning coffee to discuss terrorism with the mandarins of government is, I accept, a rather unusual entry in anyone's diary. On a cold day before last Christmas, we assembled in a small dark room in Whitehall. No paintings on the walls, no windows to gaze through but compensation courtesy of an abundance of chocolate biscuits on a china plate; Panorama on one side, the normally faceless bureaucrats on the other. We had contacted the Cabinet Office and the Home Office and explained that we were producing a rather unusual Panorama, designed to assess the state of preparedness for a terrorist attack. We said that the programme would be built around a fictional scenario and we asked to come and meet them to talk about it. 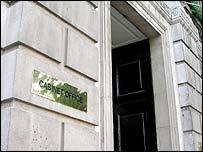 The Cabinet Office hosted an on-the-record meeting and the Home Office sent its representative. On the face of it the Cabinet Office seemed willing to help - provided we agreed to organise our terrorist attack in a way that was acceptable to them. This means car bombs are top of the list, with hostage or hijack coming in second. We said we did not believe car bombs, hijacks or hostages reflected accurately the terrorist threat prevailing in the UK. Not because we wanted to be difficult but because all our research suggested these were remnants of a bygone era of terrorism. They were also events the emergency services had good experience of, would deal with admirably and would be unlikely to warrant major incident plans being put in place. 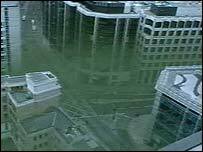 We said that a fictional terrorist attack warranted "thinking out of the box" and that it would be a good thing to examine the civil contingency efforts of government since the shocking events of 9/11. 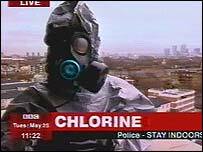 Our scenario centred on a series of suicide bombs on the London Underground followed by a chlorine tanker exploding in the east end of London. However, they said they were unlikely to help us if we insisted on this "irresponsible" scenario. They said it would give ideas to the terrorists because terrorists watch television. But they said they would need to talk to their bosses - the politicians - to gauge their view but that it was unlikely their view would be markedly different. We tried to assure them that, as the BBC's flagship current affairs programme, we were far from irresponsible and took the matter very seriously indeed. They would not be moved. We agreed to go away and review our scenario in light of their reservations and we left. To strengthen our case, we prepared a meticulous document which outlined the reasons why we had elected to pursue this particular scenario. We got in touch with the Cabinet Office and arranged a second meeting where we hoped we could raise some of our research with them to show that there was nothing irresponsible about our actions. On the morning of the meeting, I received a phone call from the Cabinet Office to say that, given that we were refusing to move from our proposed scenario, there was no purpose to the meeting. I demurred and said the research was valuable and deserved proper debate. They were not persuaded. The New Year dawned and we continued our research. Although we never had a second meeting and we had no further contact of any note, we were constantly aware of the presence of the Cabinet Office. The less discreet officials in these organisations revealed that their lack of participation was not their decision but resulted from an e-mail sent by "senior government officials"
It was fairly straightforward, really. We would call the press office of any one of the myriad organisations officially involved with civil contingencies. As soon as we identified ourselves, the conversation came to a close. The manner of termination varied from the polite promise to call back, referral to a colleague who would decline to comment and finally the downright rude. One or two of the less discreet officials in these organisations revealed that their lack of participation was not their decision but resulted from an e-mail sent by "senior government officials". They were thorough. No matter where we turned for advice or information, our way was barred. At the same time, a number of people we had asked to take part in the programme pulled out. Our original plan to create a realistic COBRA-style (emergency cabinet) meeting to respond to the fictional scenario fell by the wayside. They withdrew their support, some in a vague fashion, others more honestly. Again the word 'irresponsible' occurred. Again those "senior government officials" were mentioned. We did of course continue to test out our so-called 'irresponsible' scenario with experts, former police officers, former intelligence officers, politicians, emergency planning officers and terrorism experts both here and in the US. No-one else used the word 'irresponsible'. A number told us that an exploding chemical tanker had been discussed within government and that it would be a real test of our ability to cope. Everybody took what we were saying very seriously and agreed that it was a worthwhile project. Several officials, banned from talking to us, were keen to assess for themselves how 'irresponsible' we really were. As people in the front line of emergency planning and organisation, they believed it was plausible. As a consequence, some of them ignored the ban and helped. Naturally the lack of official co-operation made our research more complicated but it failed to stop us. Enough people officially and unofficially wanted to help. They talked to us, shared concerns, showed us documents and told us where the gaps are. In early March, we went back to the Home Office with a list of questions, based on the Home Secretary's update on civil contingency issues. Our questions were not answered. We said they were legitimate journalistic questions based on a document in the public domain. We were told that since the programme was 'irresponsible' there would be no answers. As the dates for final filming drew closer, several more people withdrew from the programme, feeling "under pressure". Unbidden, the Cabinet Office did call to try to find out who was taking part in the programme and if the scenario had changed. Although there was still no government co-operation, we decided to submit an early request for an interview with the Home Secretary. We wanted the Home Secretary to be able to respond to issues raised by the programme. The Home Office replied by saying that the request would be put to Mr Blunkett if a number of conditions could be satisfied. These included having a full list of participants, having a rough cut of the programme plus a guarantee that nobody else would be interviewed after the Home Secretary. We pointed out that these are not procedures normally adopted by programme makers at the BBC. Our request for an interview was declined by the Home Secretary "on behalf of the government". In the end Panorama has produced a programme which uses a different format to address a subject which we know is in the minds of many. During the time of production, there have been many documents and reports produced relating to terrorism. Terrorist suspects have been arrested across England, senior officials have continued to warn about a potential attack and other countries have suffered at the hands of terrorists. Sadly, a terrorist attack in the UK and notably in London, remains a strong possibility. We did not set out to do battle with this government. Our aim was to engage with them and the many others involved in preparing for a terrorist attack to show the strengths and weaknesses of emergency planning. Never has the public been more entitled to know what might happen if we are attacked. In programme making, we sometimes fool ourselves that important stories are matters of life and death. This time, it's true. Simply wanting to tell that story cannot be "irresponsible".